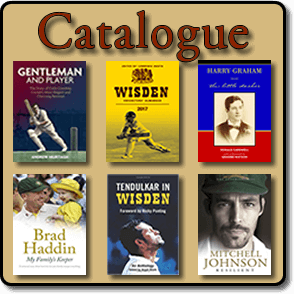 Welcome to Roger Page Cricket Books Catalogue October 2018. The catalogue is updated every two months. Our October 2018 catalogue is full of a range of carefully selected cricket books and cricket collections. These include the biographies and autobiographies of famous cricketer players. Our catalogue contains a large range of selected cricket books on a wide variety of subjects relating to cricket, people, cricket tours, ephemera and cricket collections. Our popular section on Forthcoming Cricket Books keeps you up to date with your cricket reading and literature.